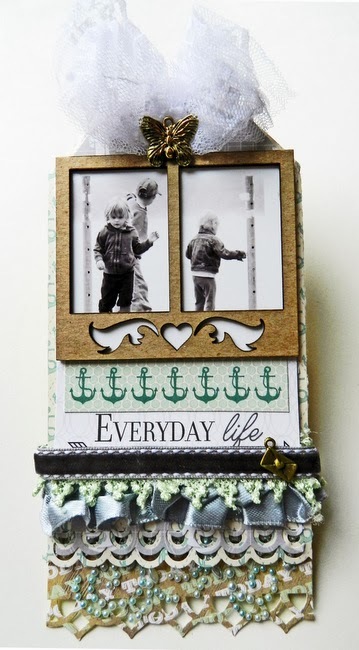 Erin Blegen: My Scrap Cabin: Webster's Pages: Tags! I have a couple of Webster's Pages projects to share with you; a couple of tags created using some of the new Clean & Simple lines. I hope you enjoy them! I have been closely studying the Bible for the last year, and I'm finding that the more I read, the more I learn, and the more I'm discovering the things in my life that need to change in order to walk hand in hand with God's will. So when I saw this sentiment in the New Year, New You collection, I just knew I needed to create something as a positive reminder of my journey in faith and of its importance- and that, truly, I am not afraid to change! Next we have a tag that I created using the popular Recorded collection. I'm a sucker for layers (you probably know that by now)- I used plenty of Webster's Pages trims, papers, and even a sweet little charm to do up the bottom of my tag. Thank-you for coming by today. See you back tomorrow with some new projects! Oh, I just LOVE what you do! Gorgeous tags - love the layers and use of the collections. Very inspiring! They are simply fabulous! I just love all your layers! I was so excited to see more tags as you know I love them! These are beautiful, of course! I love the inspiring sentiment on the first one and the fact that you used photos on the second one. The border punched edges look so pretty. Hope you'll do a tutorial on the tag layers and bows sometime. Beautiful tags. It is wonderful to see how openly and honestly you share your relationship with our awesome Savior.